Dell's PowerEdge M710 is a foundational blade server, which essentially means this is a great first coice for populating your PowerEdge M1000e enclosure because it offers high performance processors, dense memory, and substantial storage. The M1000 blade enclosure provides a modular chassis to not only help your business grow with unparalleled efficiency, but you will also realize a faster ROI with shared power, cooling, and networking. Intel's 5520 chipset supports a maximum of two Intel Xeon 5500 or Xeon 5600 series processors with up to six cores. With the 5500 series processors you get 8MB cache, while the 5600 series processors support 12MB cache. A two processor configuration supports 18 memory slots on the system board. Each processor controls nine memory modules, for a total of 18 active memory sockets in a two processor configuration. Each processor supports three memory channels with up to three DDR3 registered (RDIMM) modules per channel for single-rank (1R) and dual-rank (2R) modules, or two RDIMMS per channel using quad-rank (4R) RDIMM modules. Unbuffered DDR3 DIMMs (UDIMM) are also supported. 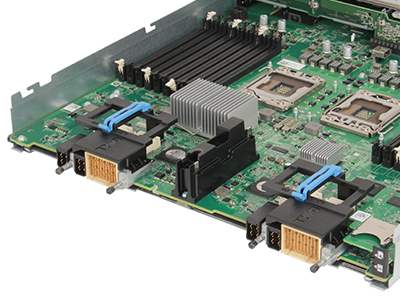 The Dell M710 blade server will support a maximum of 288GB using 16GB memory modules in all memory slots. The Dell M710 server supports a maximum of four hot pluggable or non-hot pluggable SAS or SATA SSDs, SAS HDDs, or nearline SAS HDDs. Maximum internal storage for this platform is 4TB. Administrators have options when choosing an HD/RAID controller, including the PERC Modular H200 and the PERC Modular H700 controllers both of which feature 6Gb/s transfer speeds. The system also features an SD card slot for an embedded hypervisor. Optical drives are optional equipment. Four PCIe 2.0 mezzanine card slots are supported. Installing mezzanine cards in the blade server requires complimentary cards be installed in a corresponding M1000e I/O Module (IOM) with the same fabric technology. Several different network interface cards (NICs) are supported and offer dual and quad port connections with speeds of 1Gb/s and 10Gb/s. External storage arrays are also supported using HD/RAID controller mezzanine cards in the server blade chassis paired with the appropriate M1000e I/O Modules (IOM). Video is provided by an integrated Matrox G200 video card which is part of the integrated iDRAC6 management module. Management of the server is handles by the OpenManage suite of tools, which includes iDRAC6 with LifeCycle controller. iDRAC enables the server to be accessed remotely or in a data center lights out environment. Dell's Chassis Management Controller is a key feature of the M1000e enclosure and enables management of a single blade chassis, groups of blade chassis and multiple enclosures in the same data center or on the other side of the globe.